Researchers have found that a variety of plants possess defensive features that repel plant-eating insect pests. Carnivorous plants demonstrate the most direct and well known method of defensive plant behavior, as these rare plants literally consume and digest nearby insect pests with a menacing jaw-like feature. However, most plants that have been studied for their ability to fend-off damaging insect pests do so by producing certain chemicals that repel insects. Some popular agricultural food products have been tested for their usefulness as termite repellents. Some of these agricultural products include garlic, black tea leaves, and spices like turmeric and ginger. Laboratory termites demonstrated a range of different behaviors after being exposed to these various foods and spices. When a group of termites belonging to the H. indicola species were exposed to garlic, every member of the group died from the exposure within a 24 hour period. Another study had a group of Japanese termites known as Reticulitermes spertus Kolbe exposed to garlic oil. Like the first study, 100 percent of laboratory termites died within 24 hours after being exposed to garlic oil. Based on these two studies, garlic is widely recognized as being one of the few reliable forms of natural termite control, but it may be insufficient for combatting termite infestations in structures. Studies have shown that the spice known as turmeric works to suppress progeny production in certain beetle species, but when turmeric was applied to a group of termites, an unexpected behavior change resulted. 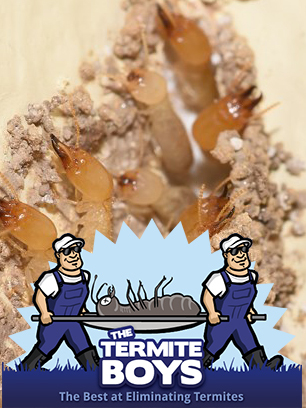 Unlike garlic, which caused worker termites to move at progressively slower speeds while foraging, turmeric caused termites to speed up their movements while foraging. Ginger is another spice that has proven effective at controlling insect pests. One past study demonstrated ginger’s effectiveness at preventing whitefly infestations in tomatoes. When termites were exposed to ginger, they all died after a five day period. With the exception of turmeric, all other agricultural products like garlic, ginger, black tea and tea-tree oil caused worker termites to move more slowly while foraging. Resting periods while foraging also increased in duration before all the termite subjects eventually died. Garlic won-out as the most effective termite repellent tested. The termites used in these studies died from normal plant components known as alkaloids. When alkaloid compounds are ingested they have dramatic effects on animal nervous systems. Plant-alkaloids intoxicate humans and they can be deadly to humans when consumed in high doses. However, the overwhelming nervous system effects of alkaloid consumption in insects ensures their demise even in tiny doses. Do you think that the alkaloids in garlic could be used to develop more effective forms of termite control?